Congratulations to Reggie Jean, Dorchester YMCA Teen Director, for receiving the Light of Dawnn award which honors the legacy of Dawnn Jaffier and her passion and dedication to improving her community and investing in its young people. Dawnn, a beloved youth worker, was the innocent victim of gun violence last summer. 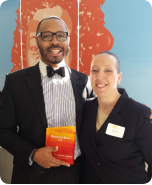 Reggie was one of three awardees selected from over 50 applicants in recognition of his excellence in providing engaging teen programming and overall dedication to Boston youth. Dawnn’s family and friends presented this award to Reggie at a ceremony at the West End Boys and Girls Club last month attended. 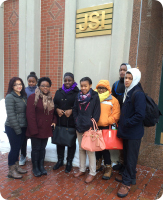 While many teenagers spent their February vacations relaxing, teens from the Roxbury YMCA were hard at work polishing their networking and employment skills thanks to volunteers from Sun Life Financial and John Snow International. Ten teens visited both companies during February vacation for onsite workplace tours and tutorials on networking, dressing for success and interview skills from Sun Life and JSI employees. Tuesday, March 24, is American Diabetes Association Alert Day. In the United States alone, diabetes affects nearly 29 million people. Another 86 million Americans have pre-diabetes, yet only about 9 million are aware of it. People with pre-diabetes can reduce their risk for developing Type 2 diabetes by adopting behavior changes that include eating healthier, increasing physical activity, and losing a modest amount of weight. The YMCA’s Diabetes Prevention Program is helping those at high risk of developing Type 2 diabetes. This research-tested program is shown to reduce new cases of Type 2 diabetes by 58%, and by 70% in adults over 60 years of age. The Burbank YMCA in Reading and the Charles River YMCA in Needham are now registering participants. To learn more, email us or call 617-927-8077. ForsythKids Oral Health Program visited the East Boston YMCA Toddler/Preschool Program last month. The ForsythKids program works with schools and community partners to make certain it is easy for children and their families to get high quality dental care. 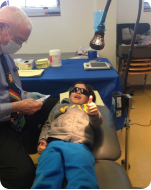 On February 25, 34 children received on-site dental care at the East Boston Y. The children had dental exams, teeth cleaning and fluoride treatments. Each child went home with a toothbrush, children’s toothpaste and dental floss. 1. Set aside 10 minutes out of your week to plan your workout times. Treat it like a work assignment, and integrate your workouts right into your schedule. 2. Plan for urgent, higher priority items in your day to come up by creating a Plan A and a Plan B. Have a backup plan for your physical activity session. 3. Plan a focused 30-minute workout. If you can go longer, great. But understand there are tremendous health benefits from 20-30 minutes of exercise. If you can’t fit in structured exercise think about how to add in non-structured physical activity into your day, like a walk with a friend. Add in fit breaks during your work day. This is a 5-10 minute break from sitting at your desk where you just get up and move, or even add in some body weight exercises. Consider conducting a walking meeting. 4. Use technology to your advantage. Add a fitness app to your phone to track your exercise and/or eating; invest in an activity tracker. 5. Associate yourself with other people with similar fitness goals. Statistics show you are much more likely to be successful in developing an exercise habit if you are connected with other people with similar goals and interests. For help creating a fitness plan, contact a YMCA personal trainer or check out our group exercise classes. In celebration of Women's History Month, we honor YMCA Training, Inc. graduate Jessica, who shares her story in her own words. "Before I started at YMCA Training, Inc., my 3 sons and I had actually become homeless. I was struggling through a job readiness program, exhausted much of the week, and my oldest son was having a very rough time in the neighborhood. I was frightened. Trying to balance the pressures of parenting with the program’s requirements and a personal life - and all without us having our own home - had brought me way down. But I was too embarrassed to tell anyone. It was about this time that my instructor posted information about YMCA Training, Inc. I was accepted into the next cycle, and I had a strong feeling that YMCA Training, Inc. would send me on the path to a job with a chance for advancement. My days became even more fully packed and I was still feeling discouraged. But, that feeling was shrinking a little and I was determined to not give up after coming this far. It helped that at the program I received a ton of encouraging advice to stay focused and to remember that more opportunities were coming my way. After 10 weeks of training, I was asked to provide a tour for representatives from Boston Medical Center HealthNet Plan. And things started rolling - fast. I was a little nervous, but I accepted the chance to meet our guests and to network with actual employers. I was turning the negative into the positive, which my instructor had encouraged us to do both with customers and with ourselves. When the next hiring session came at BMC HealthNet Plan, I was remembered and called to take the assessment to be part of the group. Now I am EMPLOYED as a Member Services Representative and I have been working full time for 6 months. Providing that tour for BMC HealthNet Plan led directly to my success. I hope to one day be a manager for BMC HealthNet Plan and to continue to encourage and model best practices for the new Member Services Reps. And maybe one day I’ll visit Training, Inc. for a tour." The YMCA Young Professionals (YYP) group held their winter Financial Fitness Workshop event last month at State Street Financial Center in Boston. The workshop was attended by over 100 young professionals and was led by panelists including Jana Abramson, Vice President and Wellesley Branch Manager at First Commons Bank; Oscar Moreno, Senior Vice President of Retail & Business Banking at First Commons Bank; Cuan Coulter, Executive Vice President and Chief Compliance Officer at State Street; Jon C. O’Brien, CFP, Investment Specialist and Financial Services Representative at Baystate Financial; and Ann Tikkanen, Executive Vice President and Chief Financial Officer at the YMCA of Greater Boston. The workshop focused on best financial practices for young professionals including personal loans and building credit, reducing debt and saving for the future. The panel also provided advice regarding career development and the benefits of networking. YYP brings together young adults in the community and provides an environment where young adults can network and learn about relevant topics from Boston’s business and civic leaders. To get involved or learn more about upcoming events, visit the YYP Facebook page. The YMCA of Greater Boston is pleased to announce a new addition to its executive staff with the recent hire of Ann-Margaret Gutierrez, to fill the role of executive director of the East Boston YMCA. Ann-Margaret is a 17-year Y professional who most recently served as Senior Director of Youth for the family and community programs at the YMCA of Greater New York. During her ten years in this role, Ann-Margaret established the Bronx YMCA New American Welcome Center, established various youth camps, and initiated new community partnerships. These partnerships provided monetary, voluntary, and in-kind resources for low-income families, and sponsored college tours and scholarships. 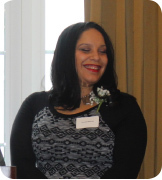 A graduate of Audrey Cohen College, Ann-Margaret also served as the New Beginnings High School Director and Adolescent Program Director at the West Side YMCA in New York. Ann-Margaret managed several youth programs, and created and implemented its first peer education program and LGBTQ support programs for teens. Later, Ann-Margaret traveled to Venezuela, Costa Rica, and Thailand with the YMCA Global Teens program to provide leadership development and service learning projects.